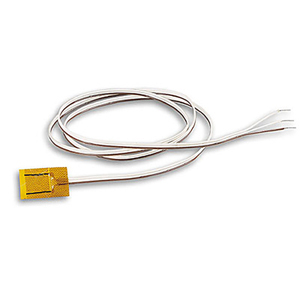 Models SRTD-1 and SRTD-2 are polyimide insulated surface mount RTD temperature sensors designed to provide a practical method for measuring surface temperatures. These sensors are small and flexible, and their low mass has minimal thermal effect on the material being measured. They are ideally suited for applications where the sensor can be mounted to the surface being measured using adhesives (OMEGABOND™ 101 and 200 epoxies can be used) or other mechanical mounting methods. 참고: Additional lead wire is available, add suffix “-X” (where X is length in inches) to model number and add $5.00 for each additional foot or fraction thereof to price. Comes with complete instructions.